I am going to start with a straight-out confession; I found the writing of this book difficult which directly affected my enjoyment of it. Now, I’m not going to claim I am hugely familiar with 19th century style of writing, but I love me some Austen and have recently read and enjoyed some Wells and Wilde. 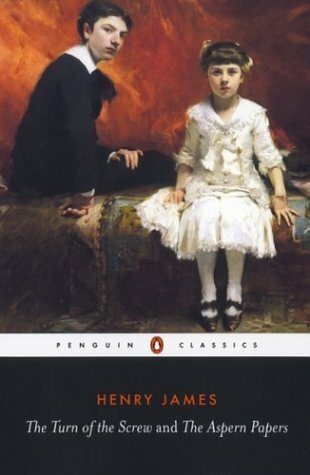 I had heard that Henry James could be a bit more taxing and so I thought I would start with this, one of his shorter novels and one that appealed to the sinister, horror-fan that I am. The book opens on a Christmas Eve night. A group of friends are sitting around when one says that he has a manuscript of a now deceased former governess. And so, from the perspective of our un-named governess, our story begins when she comes to care for two young orphans. Hired by a remote Uncle whose main stipulation is that he wants no contact whatsoever in regards to the children’s care, our young storyteller meets the younger of the two first. She is immediately caught up in the child’s beauty and is quick to grow genuine care and affection for young Flora. Flora’s older brother Miles is away at school, but the first note of not all being right is struck when a letter arrives advising that Miles has been expelled from school. Distraught at such news, when Miles does arrive home the governess is also charmed by his beauty, enough so to put the letter aside and dismiss it as an error or failing on the part of the school. All seems to be going along perfectly when our storyteller begins to see a man and a woman in and around the house, both of whom are strangers to her. She soon learns that she is seeing the ghostly appearances of her predecessor, Miss Jessel and her lover Peter Quint, ghostly because the are both now dead. From here the situation only worsens for her as she begins to suspect that the children are aware of these visitor and are actively interacting with them. It seems that the close relationship that Jessel and Quint had with Flora and Miles in life has continued after their death. This story is genuinely creepy. The children are unnerving with their angelic appearances being at odds with the knowledge and co-operation with our spectral duo. And it is their barefaced lies in the face of interrogation, their sweet voices and their sly smiles that really ups the ominous tone. The appearances of our not-so-dearly departed two also startle but all of this is undone by the very wordy and long-winded contemplation of our narrator. This introspection and its intensity are there to make the reader begin to doubt that everything is right with our governess and her version of events, but it is just so wordy and long-winded (repetition and italics.) I am a reader in this day and age and not that of when the book was written, so I can’t comment on the appropriateness of this. All I can comment on is that it made a short novel seem really long and a chore to finish. There was something in the small valour of it that quite finished me. These three words from her were in a flash like the glitter of a drawn blade, the jostle of the cup that my hand for weeks and weeks had held high and full to the brim. And that now, even before speaking, I felt overflow in a deluge. Just when my mind would start to wander, a phrase or paragraph like the above would pull me back in and make me appreciate why this book is on the list and just what it was contributing to my ongoing reading education. At the end of the day, to admire the technical proficiency is good, but I want to enjoy what I read and to learn and grow from it but not feel like it is an assignment to endure. It is a horror story and it achieved what a horror story should; it was creepy and eerie and frightening as well. But I am pretty sure that boredom is not on the list of what a great book is supposed to do and yet boredom is the overriding memory I take away from it. I give it a 2/5 rating.